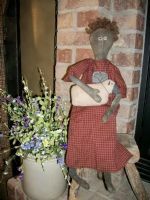 Sarah is a great primitive doll that can be set anywhere in your home! She measures 23" and is made to sit. 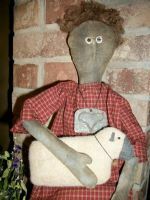 She is holding her pet sheep that is made of wool with a black face and a rusty bell around his neck. Sarah is wearing a red & mustard checked homespun dress with a rusty heart cookie cutter as her necklace. 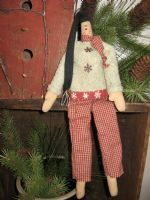 Her face has a pinch stitched nose with wool & black snaps for eyes. 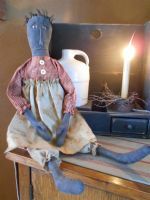 Her hair is raw wool that has been needle felted to her head. 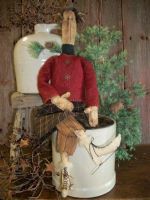 Sarah can also be purchased as a pattern. $34.50. FREE SHIPPING IN 48 U.S. Others E-Mail me. 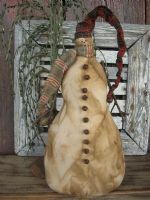 I offer $$ off average US shipping costs.